Hundreds of Pentagon employees gathered last week to say goodbye to their community's longtime unofficial mayor, David O. "Doc" Cooke. Cooke died June 22 from injuries he suffered in an automobile accident June 6 when he was driving to a conference in Charlottesville. The Defense Department's highest-ranking civil servant, Cooke had worked at the Pentagon for 45 years under 15 different secretaries of defense and was still on the job at age 82. Secretary Donald Rumsfeld, who presided over the memorial tribute on Friday in the center courtyard of the Pentagon. Cooke served as the Pentagon's director of administration and management, as well as director of Washington Headquarters Services. In a position that carried great power, Cooke was remembered as much for his humanity as for his accomplishments. "Doc was a happy warrior, yet he was a very serious man," Pentagon historian Alfred Goldberg, a colleague of Cooke's for 30 years, said in his remarks at the tribute. "Doc didn't walk on water, but he was a very fine swimmer," Goldberg added. Rumsfeld said it was Cooke who insisted on making many of the structural safety improvements in the Pentagon renovation that have been credited with protecting many lives in the Sept. 11 terrorist attack. "Without the steel walls, the Kevlar cloth, the blast-resistant windows that Doc insisted upon throughout the 1980s and the 1990s, many more than 184 lives would have been lost that day," Rumsfeld said. On the day of the attack, Rumsfeld added, "Doc was right there, aiding the rescue workers, assisting with recovery operations and later remembering those who died in the service of their country." Two days before the tribute at the Pentagon, Cooke was buried with full military honors at Arlington National Cemetery. He was laid to rest in a spot across from the Pentagon, Rumsfeld noted, "on a hillside where he can continue to watch over the building and the institution." nickname "Mayor of the Pentagon." "On behalf of all those assembled here and the entire Pentagon family, I offer profound thanks for his life and for his service," said Defense Secretary Donald H. Rumsfeld, "and our deepest sympathies to his children and to his grandchildren." Cooke, who served under 15 defense secretaries, was 81 and the Defense Department's highest-ranking career civil servant as department director of administration and management. He died June 22, 2002, as a result of injuries sustained in a June 6, 2002, car accident in Virginia. Cooke was responsible for the physical plant and personnel administration of the Pentagon. "He was loyal and a dedicated advocate of career civilians and of the military alike," Rumsfeld said in the service in the center courtyard of the Pentagon. "But perhaps the greatest tribute to the building he loved and the employees he championed was the renovation that saved so many lives on September 11," Rumsfeld said of refurbishing done in previous years. Without the steels walls, blast-resistant windows and other features that Cooke for fought for, Rumsfeld said, "many more than 184 lives would have been lost that day" when terrorist hijackers crashed a commercial jet into the building. Attending along with Cooke's family and Pentagon employees were Secretary of State Colin Powell, a retired General and former Chairman of the Joint Chiefs of Staff; Deputy Secretary of State Richard Armitage, who was an Assistant Defense Secretary for Asian affairs in the 1980s; former Defense Secretary Frank Carlucci, and former Defense Undersecretary Rudy deLeon. A Naval officer during World War II, Cooke was buried with full military honors Wednesday in Arlington National Cemetery, which is adjacent to the Pentagon — "on the hillside from which he can continue to watch over the building and the institution he loved and cared for over 40 years," Rumsfeld said. David O. "Doc" Cooke, whose 44 years of service at the Pentagon earned him the nickname "Mayor of the Pentagon," died June 22, 2002, at a Charlottesville, Virginia, hospital from injuries sustained in a single-car accident earlier this month. He was 81. Captain Cooke was the Director of Administration and Management and had worked at the Pentagon since 1958, when then-Defense Secretary Neil H. McElroy tapped him to serve on a task force for Defense Department restructuring. Defense Secretary Donald H. Rumsfeld paid homage to Captain Cooke at his Pentagon press briefing Thursday, citing Captain Cooke's dedication, longevity and wisdom. "When I came back to the Pentagon after being gone for a quarter of a century, why, many things had changed, but one thing remained the same, and that was Doc was still here," Mr. Rumsfeld said. "I know that many of you know that he came to the Department in 1958. And every Secretary of Defense since has relied and depended on his advice and the leadership he has provided. For some 44 years, Doc Cooke helped to ensure the safety, security and smooth operation of this Department, earning him the nickname of 'Mayor of the Pentagon.'" Captain Cooke was a Buffalo, New York, native and graduated from the State University of New York at Buffalo in 1941. He earned a master's degree from SUNY at Albany in 1942. During World War II, Captain Cooke served in the Navy. He earned his law degree from George Washington University in 1951. He returned to active duty and served in various posts until retiring as a Captain in 1968. General Richard B. Myers, Chairman of the Joint Chiefs of Staff, echoed Mr. Rumsfeld's praise at the briefing Wednesday, paying special attention to Captain Cooke's continuity at the Pentagon. "While we in uniform are transient personnel that come and go, Doc was the permanent fixture, always welcoming us to his building," General Myers said. "And we're sure all going to miss him, I can tell you that. As a personal anecdote, I've got to go back to September 11th. As the Secretary and I were in a couple of smoke-filled command centers, the other person there that I can remember vividly was Doc Cooke, because, after all, his building was attacked. And he took that very personally and was right there by our side through all of that. He was a real trouper, added so much to the Department of Defense, and we, as I said, will miss him." Charlottesville, according to the Greene County Sheriff's Office. He was airlifted to the University of Virginia Medical Center at Charlottesville, where he was in critical condition until he died, according to a hospital spokeswoman. The Pentagon is planning a memorial service, but it has not yet been scheduled, a Pentagon spokeswoman said. A funeral service will be held at 9 a.m. July 10 at Word of Life Assembly of God Church, 5225 Backlick Road, Springfield. 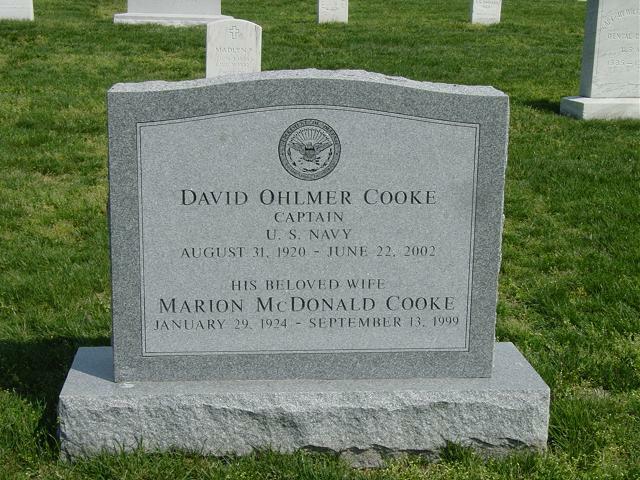 At 11 a.m., Captain Cooke will be buried with full military honors at Arlington National Cemetery. servant as department director of administration and management. He died June 22 as a result of injuries sustained in a June 6 car accident in Virginia. 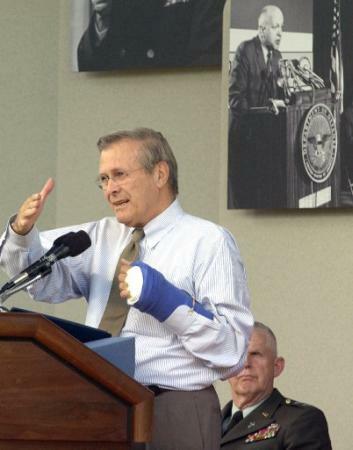 Rumsfeld's hand is in a cast after surgery Monday to correct a problem with arthritis. Gen. Gaylord T. Gunhus, U.S. Army chief of chaplains, right, looks on.